92. 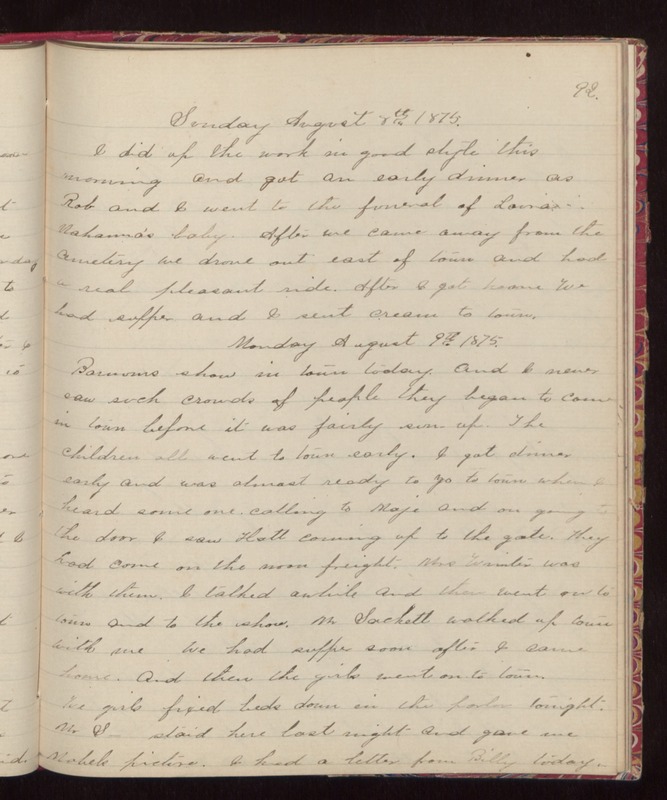 Sunday August 8th 1875. I did up the work in good style this morning and got an early dinner as Rob and I went to the funeral of Laura Mahanna's baby. After we came away from the cemetery we drove out east of town and had a real pleasant ride. After I got home we had supper and I sent cream to town. Monday August 9th 1875. Barnums show in town today. And I never saw such crowds of people they began to come in town before it was fairly sun up. The children all went to town early. I got dinner early and was almost ready to go to town when I heard some one calling to Maje and on going to the door I saw Hatt coming up to the gate. They had come on the noon freight. Mrs Winter was with them. I talked awhile and then went on to town and to the show. Mr Sackett walked up town with me We had supper soon after I came home. And then the girls went on to town. We girls fixed beds down in the parlor tonight. Mr S_ staid here last night and gave me Mabels picture. I had a letter from Billy today.